"My technician, Randy Halal, was knowledgeable and thorough. Thank you, Randy!" My technician, Randy Halal, was knowledgeable and thorough. Thank you, Randy! ""Randy" has been here yearly & went far & above the average service man-so helpful in instructing me of what I need to do..."
"Randy" has been here yearly & went far & above the average service man-so helpful in instructing me of what I need to do in the near future! Could not ask for a better representative of you company!!! The service techs very professional, knowledgeble + courteous. They deserve a bonus. I trust your company completely! You have installed an industrial dehumidifier, two sump pumps, french drains and two battery back ups! Your office staff is excellent and the service techs Randy and Kyle are so sweet. I refer your company to all my clients! Thank you for doing the job right! Randy and John are stand up guys and answered my questions more than adequately. Very friendly professional and thorough ! Randy and his assistant were very polite, efficient and knowledgeable. I appreciate that Randy let me watch the whole procedure. I was interested in how the sump pump worked and they explained everything. The technician was very professional. The service was performed well and I am happy with my decision on going with Tom Roman's Company, Quality 1st Basement Systems. We have had a basement system for 7 years and it has been working great. We just had Randy provide the yearly maintenance and he was very knowledgeable and professional. 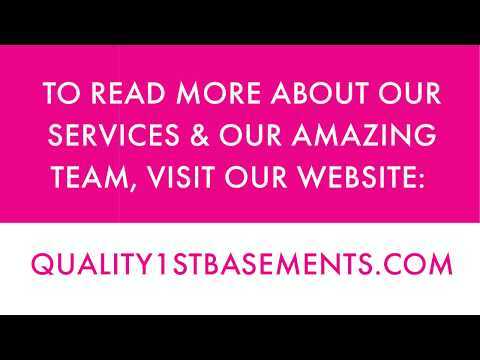 I would highly recommend Quality 1st basements. Don't hesitate to use this company!I have used Quality 1st Basements for probably ten to fifteen years. I called them out initially, and they installed a sump pump after the prior one had failed. Then, they came out to do yearly services on it. What I really like about this is they call me, and I don't have to remember to call them for the yearly maintenance. During one of their service calls, I asked about tying in my roof drains. I had one at the front of my house that would flood out my flower beds and wash all the mulch into the sidewalk when it rained. I wanted to tie that into a PVC pipe that could be tied into the sump pump. I had two down spouts, and they tied those into the sump pump drainage. My sump pump has a good life span, by the way, and I only recently had to replace the battery for it. They have done other work for me, too. I was tired of having a dirt floor, and I wanted a basement wrap system. This is basically a water proofing system, and it's like a plastic membrane with channels in it so the water can find its way to the sump pump. They offered a payment plan for that, and I really liked that. I had one year to pay it off with no interest. On another yearly service call, his gadget told us the humidity level was really high. I knew the crawl space was pretty damp, but I can be skeptical, and I was. He did such a good job explaining what the gadget was showing and was so patient answering my questions until I had a good understanding of what was going on. I thought about it, and I decided it was probably best to have them install a dehumidifier. Everything they have done for me has turned out great. i haven't had any problems with anything, and I have really enjoyed working with them on the various projects. They come highly recommended from me! Meet Randy, Our Service Technician! Randy was a pool service tech for 8 years before coming to Quality 1st Basements. He worked as a disaster restoration tech for 4 years during the off season. Quality 1st Basements saw what an asset Randy would be to the company with his eagerness to help others, excellent customer service skills, and mechanical ability. He upholds the highest standards of ethics in his daily business practices. Randy is a true professional. In his spare time, Randy enjoys spending time with his wife and kids, learning new things, doing home projects, and watching boxing. Having annual maintenance done on your sump pump system is very important. Without proper checks and cleanings, the pump will fail and your basement will flood. This is exactly what happened to a homeowner in Flemington, NJ. Quality 1st Basements replaced the failing, old sump pump with our TripleSafe Sump Pump System. Not only does our TripleSafe have an airtight lid to prevent water vapor from evaporating into the basement air but also has an alarm system to alert the homeowner if the pump fails. This lets the homeowner now right away that we need to be called. This homeowner contacted Quality 1st Basement Systems in regards to water coming into their basement. They said their basement walls were wet and believed there was mold around the existing sump pump. Quality 1st waterproofed the entire basement with WaterGuard, installed a SaniDry Dehumidifier to remove moisture from the basement and installed a waterproof and mold resistant wall panel known as EverLast Finished Wall Restoration. This homeowner living in the beautiful town of Belmar noticed that their front porch had sunken a few inches into the ground. This made the front of the homeowner's house look uneven. The homeowner made the right choice and decided to turn to Quality 1st Basement Systems to help solve their problem. System Design Specialist, Tom Carrano, inspected the front porch and suggested PolyLevel as a solution. Project Manager, William Perez, and his crew injected PolyLevel to raise the porch. In only a short time the porch was raised and leveled, leaving the homeowner satisfied. A homeowner in Hazlet, New Jersey had an old sump pump in the basement and needed a new one so the homeowner contacted Quality 1st for a solution. Our System Design Specialist suggested that a new sump pump be installed in the basement. The TripleSafe sump pump was installed to make sure the basement is fully protected. The TripleSafe has three levels of pumps built inside in case of one pump failure, the next lower level pumps will kick in and ensure the basement stays dry. A homeowner in Newark had a crawl space that had water and dampness so they contacted Quality 1st Basements for a solution. Our System Design Specialist inspected the crawl space and recommended encapsulation to eliminate the dampness. First, SilverGlo was installed on the crawl space walls to boast a radiant barrier that reflects heat back into the crawl space. CleanSpace Vapor Barrier was installed on the crawl space walls and floors to seal off the crawl space and make sure no water vapor or humidity passes through. This liner is durable and is ideal for homeowners who want to use their crawl space for storage. Any air in your crawl space travels up throughout the eniter home and so its important to make sure your crawl space is clean and dry to increase the wuality of air you and your family breathe in everyday!